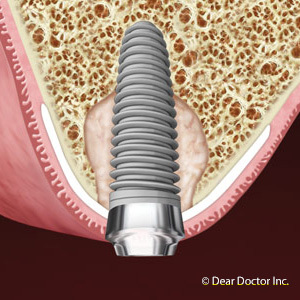 Dental implants are a great choice for many people who need to permanently replace a missing tooth. Reliable and long-lasting, they offer a highly successful outcome, and can even help reduce long-term bone loss and damage to adjacent teeth. One of the best features of implants is that the titanium metal of which they're made actually becomes fused with your natural, living bone tissue. But sometimes, an examination may show that where you have missing teeth, you may not have enough bone remaining to properly place an implant. Does this mean you're out of luck? Not necessarily! Employing the refined techniques of bone grafting, regenerating bone tissue has become a standard procedure in periodontal and oral surgery. In many cases, it's possible to build up just the right amount of bone using a variety of grafting materials, in combination with other special techniques. This can enable patients who wouldn't otherwise be good candidates to enjoy the benefits of dental implants. How does it work? Basically, by helping your body repair itself. You may already know that bone is a living tissue, which can respond to its environment positively (by growing) or negatively (by resorbing or shrinking). When you've lost bone tissue, the trick is to get your body to grow more exactly where you want it. Once we know where — and how much — replacement bone is needed, we can place the proper amount of bone grafting material in that location. Then, in most cases, the body will use that material as a scaffold to regenerate its own bone. Bone grafting is often done at the time of tooth removal as a preventive procedure or prior to the placement of an implant, to give the body time to re-grow enough of its own tissue. The procedure is generally carried out under local anesthesia, or with the aid of conscious sedation. Sometimes, if there is enough natural bone to stabilize it, it's even possible to place an implant and perform a bone graft at the same time. So if you're considering dental implants, let us advise you on what's best for your particular situation. We have the knowledge and experience to help you make the right choices, and achieve the most successful outcome.